This curry is made with ripe mangoes. It's sweet and sour in taste.Really a tasty curry to try out. Use a extra ripe mango to make this pulissery. 1 ) Cook cut ripe mangoes in one cup water with red chili powder, turmeric powder and salt. 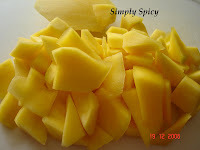 Cook till mango pieces are well cooked and can be mashed. Mash a bit of the pieces. 2 ) Meanwhile grind to a paste the ingredients listed to be ground with half the yogurt. Add 2 to 3 leaves of curry leaves also while grinding in the end. 3 ) Add to the cooked mango, whip the remaining yogurt and add to the pulissery. Mix well. Adjust salt as per taste. Bring to a boil and cook for a minute. Don't allow the yogurt to curdle.Take off the stove. 4 ) Heat oil for seasoning in a pan. Add mustard and after it pops add fenugreek seeds, dry red chili and curry leaves. Add this seasoning to the pulissery. Serve as a side dish with rice. Enjoy this delicious pulissery. This will make a good addition to Onam Sadhya. Kollaam........kalakki.A Sweet & sour curry for rice. Anonymous : Thank you so much for letting me know out this. Appreciate it. Mambazha pulissery is one of the traditional recipe of kerala. You can not find any similar recipe in any other Indian cuisine. I go visiting my mom's kitchen and there she is making a spicy pepper chicken, which is loaded with black pepper powder. So you get a rich peppery taste for the chicken and i loved having this spicy pepper chicken with roti /chapati. 1 ) Mix black pepper powder, turmeric, salt with little water and apply on the chicken pieces. Marinate for 1/2 hours. 2 ) Transfer chicken to a pan and cook on low flame, covered with a lid. Chicken will give out water, so cook in that water till chicken is fully cooked and tender. Dry out all excess water once the chicken is cooked. 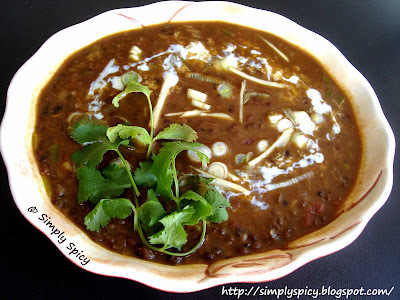 Dal makani is prepared with whole black urad dal and red kidney beans (rajma). This is a delicacy in punjab which is rich in proteins and fiber. Traditionally dal is slow cooked for hours together to get a creamier texture. 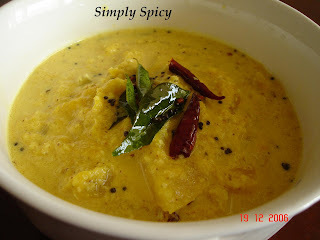 Cream /malai gives a rich taste to this dal. Since cooking dal for a long duration gives good flavor and taste, i have cooked dal in slow cooker/crockpot. Cooking duration in slow cooker is for 7 hours and by the end of which you will get a creamy dalmakhani. Dal will taste even better the next day. 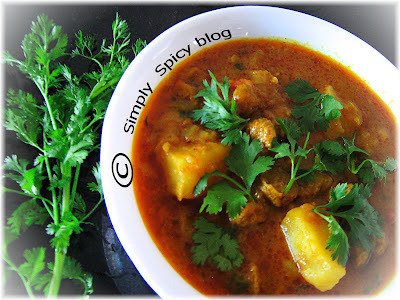 A soya nuggets / chunks curry with potato tastes more or less like a mutton curry. This gravy curry will be good with rice or roti. Also if the curry rests for an hour or so, it will taste even better with all the flavors settling in. 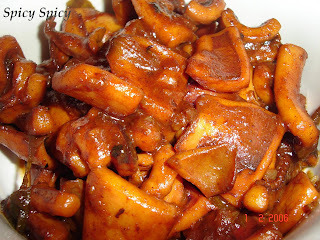 Good amount of onion and oil is used for this recipe to get good results. 1 ) Wash soya chunks then soak in enough hot water for 1/2 an hour. Squeeze out all the water well. Again wash in fresh water and squeeze out the water. Do one more time, squeeze all the water out very well and set aside. Tinda, a vegetable more widely used in the northern part of India, looks more or less like a green tomato. 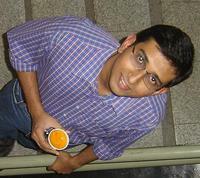 They are also called as Indian round gourd or apple gourd. Here is an interesting recipe i had noted down long time back from a friend. Got to try it now when i got some fresh tinda, that i could slit to stuff masala powder in. 1 ) Scrap the tinda skin off. Slit them slightly vertically and horizontally like a cross. Remove any hard seeds. Mix all the dry masala powders listed above together. Add salt to taste and mix well. Tinda,also called Indian round gourd or apple gourd, is an annual vine grown for its immature fruit, a vegetable especially popular in South Asia. 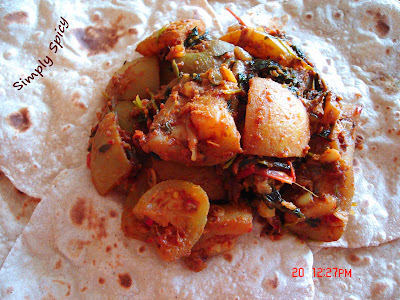 This vegetable is cooked in different ways in India, especially in the northern part of India. I heard about this vegetable from a close friend in school and was on the look out for this vegetable. Though i didn't get any fresh ones, these frozen ones turned out equally good. Going out to have Chinese is something we do often, unless it can be created at home. 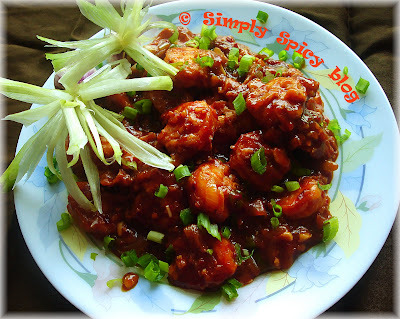 Fried prawns cooked in hot garlic sauce is delightful in taste and will make a great side dish with Chinese fried rice, noodles or just plain steamed jasmine rice. 1 ) To marinate the prawns - Mix cornflour, egg, salt to taste and mix well with the prawns. Marinate for 15 minutes. 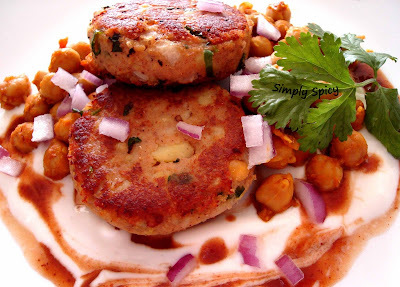 Aloo tikki is a very popular north Indian snack. These aloo tikki's are stuffed with channa dal in the center and shallow fried. You can put any veggie filling you like instead of channa.Now these tikki's can be served along with tamarind-date chutney, green chutney and yogurt. 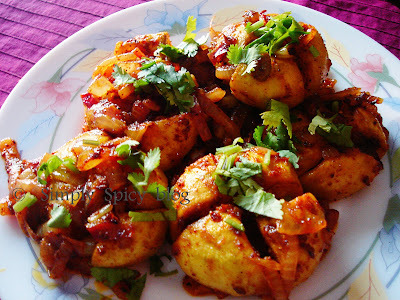 Then the next thing you can do is make chaat with Aloo tikki and serve along with choley. 1 ) Soak channa dal for 1/2 hour and cook dal in enough water with salt to taste. Dal should not get over cooked. Cook till the dal is cooked and grainy, not mashed. 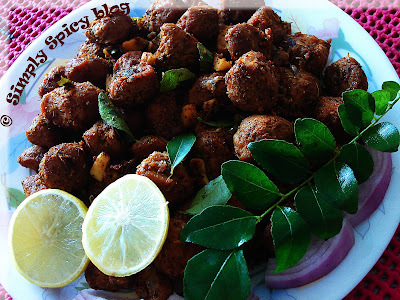 For those who want to try soya chunks, this could be one recipe you could try. 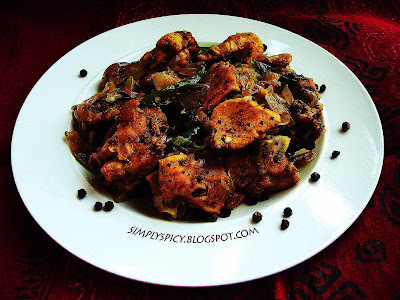 Thanks to a dear friend for this delicious soya chunks recipe. With a blend of masala, this roast has a nadan taste, that's more or less like a meat roast.